Planning a trip in Lapland can seem overwhelming. It can be kind of remote, it’s cold, it’s expensive. Not the usual beach trip where you only pack your bikini and your flip flops. So you pack up pretty much all the winter clothes you own, hopping it will be enough to fight the cold, and you get on that plane… Here’s a little bit about our trip in Lapland, hopping it can help you to get prepared -or inspire you to put this destination on top of your list! Enjoy the journey… I know I did. How to get to Lapland, finland? You can fly to either Rovaniemi or Kittilä, generally with a stop in Helsinki first. I guess if you’re more adventurous you can maybe take a train? Does Helsinki worth a stop? I spent an afternoon in Helsinki on my way to Rovaniemi, then a morning on my way back. When I booked my trip, I didn’t realise the sunlight is only from 10am to 3pm. Which mean my “afternoon” felt like an endless evening and, to be honest, I quickly ran out of things to do. I much more enjoyed my morning in Helsinki on my way back. It was MAGICAL! I walked under the snow for hours, all the way to the seaside to get my a hot chocolate w/ cinnamon in the lovely Cafe Regatta. Absolutely loved it! Finland is a heaven for any winter lover. There are so few people there you can easily be alone with nature. The territory hides no less than 187,888 lakes, often bordered by deep forests. This is not your typical travel here. Forget about your “must do” list. The best moments are the ones you won’t even plan. Like the day we crossed two stunning reindeers walking on the road. That morning walking on a frozen lake. That silence in the forest. That day we met this French guy, passionate about dog sledding, living in the wild with his dogs. That drive under the snow. Dog sledding was our most beautiful surprises. I didn’t expect such a cool experience. My friend had booked us a private tour with Huskypoint Oy and it was absolutely perfect -more expensive, of course, but worth every penny of it. We met some truly passionate people, rode in the midst of incredible landscapes, drank homemade hot berry juice by by the fire in a kota… And the sensations! Who knew dog sledding was so much fun? Well, it’s riding in the snow, of course it’s awesome, but I didn’t know I’d enjoy it that much. Of course it reminded me a bit Japow. Driving to nowhere. Then simply walking in the snow. With no map and no plan whatsoever. Just enjoying the white surroundings. And the silence. Ice floating on a lake ! Some of the craziest ones in our group went for quite an experience… floating on the water. They loved it, they swam and jumped into freezing waters in a magical wetsuit that didn’t let the water come in -so they were just wearing their usual clothes underneath. Snowmobile. Of course it’s a must… But it’s also pricey. I’m planning to go back to Lapland in a couple of years, I’ll try it then. No doubt it’s amazing. Eating Rudolph… Reindeer is yummy ! We had some great reindeer steaks in Nili restaurant, Rovaniemi. It was delicious. The salmon was great too. The typical Sami (local) atmosphere is very nice. We organised a photoshoot in the snow and it was sensational! The photographer -Krista Ylinen- was absolutely awesome, but even without a professional, you’ll come back with gorgeous pictures. 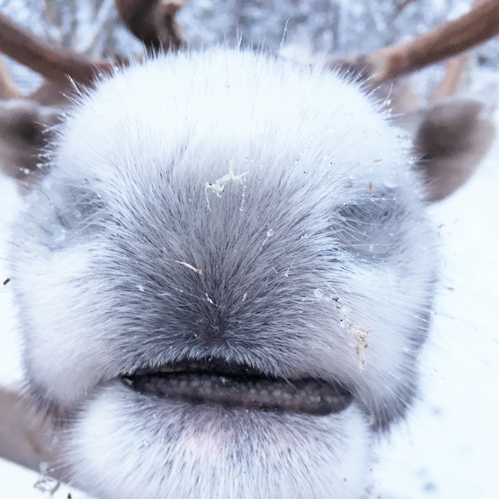 Visit a reindeer farm. It’s nice to meet the reindeers and feed them (after we ate half their family the day before) -although it was a bit too “tourist driven” in my opinion. Drink in an ice bar! Known as “the”place to celebrate Christmas, the city of Rovaniemi itself was a big disappointment. There’s just one street with restaurants and tourists shops, but no magic and not much to do. We went to Santa Claus Village and, as I was expecting, it was basically a giant outdoor mall full of tourists buses. Not what I came for. One beautiful surprise in Rovaniemi though was the Arctic Museum. The architecture is pretty amazing, and the exhibition itself very interesting. A good place to spend time when it’s night time at 3pm! Baby it’s cold outside! I mean… very cold. For the real “winter wonderland” feel, coming before mid December is risky, as you might not have any snow at all. Luckily the snow fell a week before we got there, but as I said, we were lucky! . March >>> PROS : A lot of sunshine ! best month to see some Aurora Borealis. Longer days so more sunlight. Some board games : when it’s 4pm and it’s dark, you’ll be happy to have something to do. Even though it’s beautiful outside, temperatures go from -8°C to -50°C + the sun is out only about 5 hours a day. So you’ll spend time at home. The best option is to rent a cottage, shop and cook. It’s a great activity to keep you warm and busy! The roads are well cleared from the snow and the rental cars equipped. Get a good GPS, as everything is white with forests, you could easily get lost. And trust me you don’t wanna sleep in the car! Restaurants are expensive, so we bought our food and cooked / made sandwiches. For us it was about 15€/pp per day drinks included. Accommodations aren’t cheap either, but you’ll find a whole range of prices on Airbnb. Activities such as dog sledding and ice floating take a big part of the budget too. Yes, traveling in Lapland, Finland is expensive. You can plan around 2,500€ for two people for a week in Lapland.